Shopkins Lego Sets Collect Them All! Have you seen the Shopkins Lego Sets? These Shopkins bricks are actually called Shopkins Kinstructions and can work with most major brands including Legos. They are fun buildable Shopkins Kinstructions sets that you build your self to make a play set that you can use with your Shopkins figures that are included with the set. You can use Legos to create more fun items to add with your Shopkins sets. Building and combining these sets together makes a nice little Shopkins village. These Kinstruction sets make a great gift idea for The Shopkins fans. Let’s take a look at the sets that are available for you to collect and buy. In A Hurry? ===> You can find all the Shopkins Kinstruction Sets on Amazon. 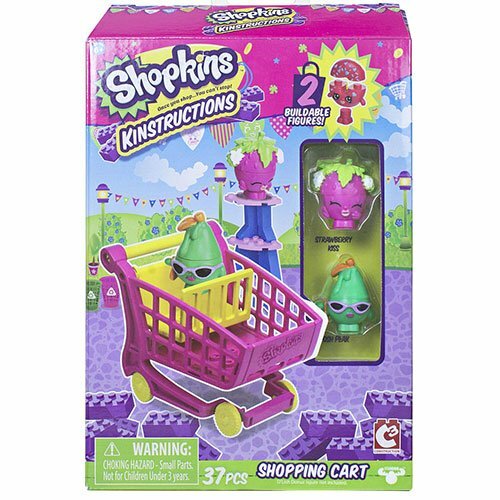 There are two of the Shopkins shopping carts that you can collect. The only difference between the two are the Shopkins figures that come with them. 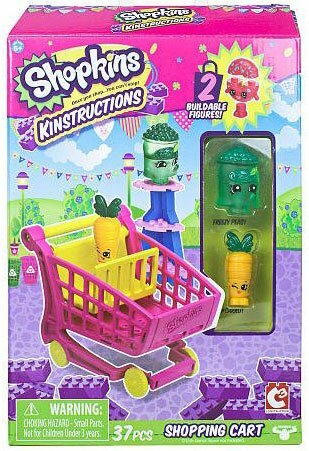 I had bought the Shopkins Kinstructions shopping cart with Freezy Peasy and Wild Carrot for my niece the other weekend as a gift. She really likes Shopkins and had never seen the Kinstruction sets before so she was thrilled. These are the smaller sets that are available and contain 37 pieces each. The Shopping cart seemed pretty durable and my niece was even able to stroll it around outside on the flower beds to collect flowers. 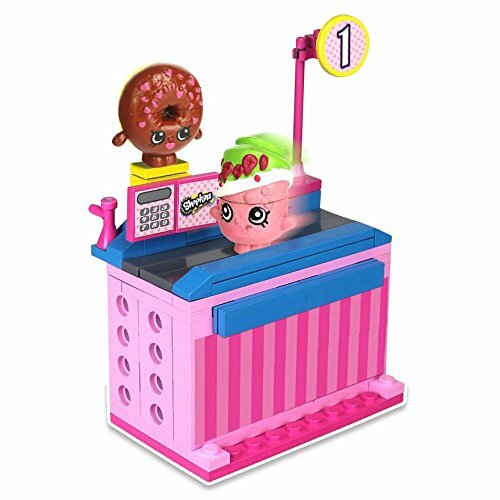 Shopkins Kinstructions Checkout is another smaller Shopkins Lego set to collect and build. Just like the shopping cart there are two choices available. 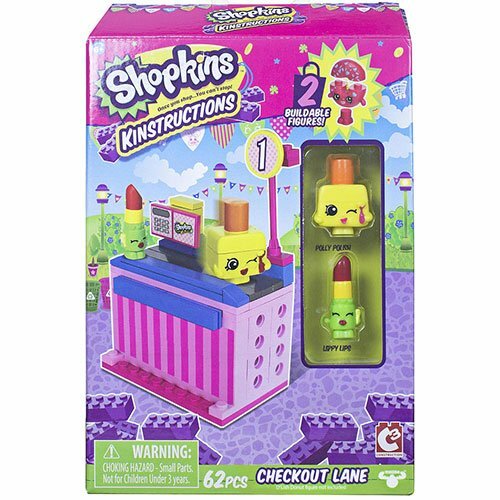 The check out style #2 has Polly Polish and Lippy Lips as the Shopkins figures and checkout style #2 has two different figures in that set so you can choose your favorite figures or get both of them! These Shopkins Lego sets have 62 pieces each and make a nice collection to go with the Shopping Cart. 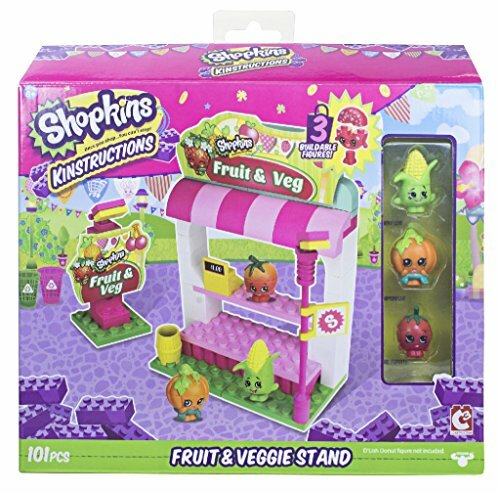 Add the Shopkins fruit and veggie stand to your town! This set comes with 101 pieces to build your fruit and veggie stand with. You get 3 Shopkins figures with this set, a corn, a tomato and a pumpkin figure for your stand. Once you have completed your fruit and veggie stand you will have a nice little stand for your shopping cart to stroll up to and collect some nice fruits and vegetables. A little cash register is included for checking out as well as stickers to jazz up your stand. 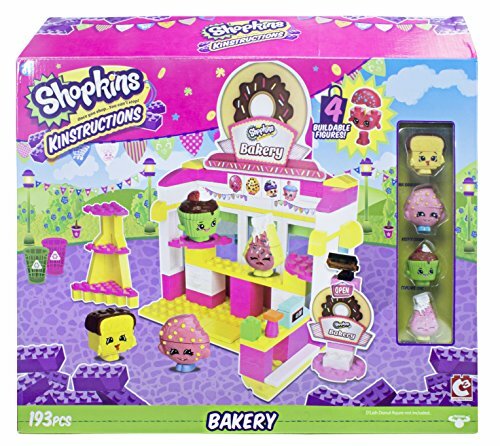 You can add this Shopkins Kinstructions bakery to your Shopkins village. This bakery set has a few more pieces than the sets mentioned above. It contains 193 pieces to build together. You get 4 Shopkins figures in this set. It looks like you get a banana bread, a cookie, a cupcake and I think the last figure is a sponge cake. The figures come together but you can take them apart and rebuild them if you would like to. You can place your built Shopkins figures on stands for display in the bakery. You also get a cash register and some stickers to place on your bakery. 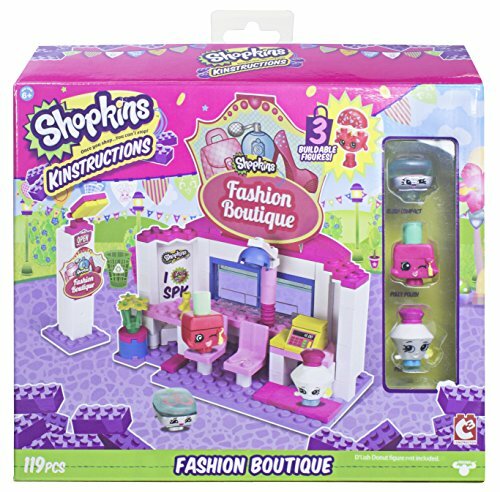 I think this Shopkins Kinstructions fashion shop is really cute and would make a great gift idea for the Shopkins fan. This is the set I’m going to get my niece for her birthday, I can’t wait to see her face light up when she see this. This Shopkins Lego sets comes with 119 pieces all together. You get 3 Shopkin figures that are suited for the boutique. There are two chairs with the set. One chair is besides a tap and the other one is in front of the hair dryer. There is a cash register, flowers and some stickers for you to place around your boutique to jazz it up. A great addition to your Shopkins toys.